Gatlinburg, Tennessee, is home to fabulous entertainment, plenty of food options, and a bounty of shopping locations. When you’re checking out places in Gatlinburg to visit, we recommend you keep these Gatlinburg points of interest in mind. The iconic yellow Gatlinburg Sky Lift is a favorite tourist location to get astounding views of the area and create a family tradition. As you journey 1,800 feet to the top of Crockett Mountain, don’t forget to smile for a timeless souvenir photo! When the new Sky Deck is complete, you’ll also be able to walk around and check out the stunning scenic landscape at your leisure. Ticket options include adult, child, and military. Hours vary seasonally. 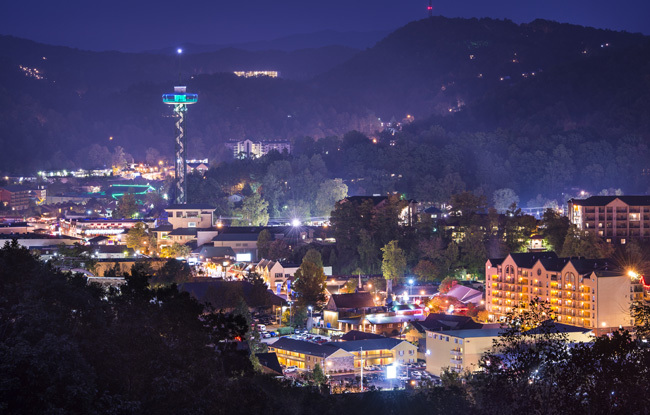 Take the elevator up to the top of the 407-foot tall tower and snap a photo of downtown Gatlinburg from any angle in the panoramic observation deck. Inside the Gatlinburg Space Needle, you’ll find a 25,000 square-foot arcade, a theatre hosting some incredible acts like the Impossibilities show, and a restaurant. It might look small from far away, but the Space Needle packs a punch! Are you looking for a stunning photo of Gatlinburg? Take the Gatlinburg By-Pass to maximize your photo opportunities. The road to get you to the overlook is well-maintained. The Scenic Overlook can be the perfect romantic spot for an engagement photo or a proposal! It seems as though everywhere you look, you’ll find an Ogle (even the City Manager of Gatlinburg is an Ogle!) and it’s no wonder. The Ogle family settled in the Smokies in Gatlinburg after the Revolutionary War. Rumors indicate William Ogle built the first known structure in Gatlinburg. When you enter Gatlinburg, don’t miss the Ogle Cabin near Traffic Light #6. It was located at Arrowmont but was donated to the City of Gatlinburg in 2015 and moved in 2016. Its history expands beyond a home, as it was used as a hospital for the Pi Beta Phi Settlement School and then a museum for artifacts after that. Across from the Mountain Mall, you’ll see the Village Shops that will make you feel as though you have stepped back in time and transported yourself to a little German village. At the entrance, you’ll be greeted by The Pancake Pantry and the Old Smoky Candy Kitchen (technically both are not part of the shops). All in all, there are 27 shops to visit. Some like the Spice & Tea Exchange, Coffee & Company, The Cheese Cupboard, and The Donut Friar sell food products. Others sell unique items, art, toys, home decor, and accessories. It’s truly one spot to shop for a variety of wares. Know of more iconic places in Gatlinburg we should add to our list? We would like to hear from you in the comments below.